Inspired by the Catholic intellectual tradition and rooted in the transformative power of learning, Loras enriches lives and serves humanity. 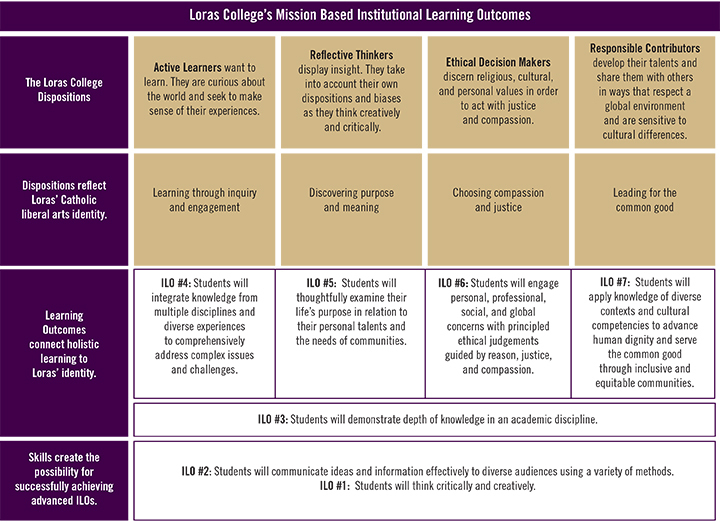 The Loras College community embraces core values that define the way we work, behave and relate with others. Truth: We are dedicated to the pursuit and communication of truth. We rely on the integrity of each individual to create a community that engages freely and creatively in the search for truth and grapples joyfully with intellectual and moral issues. Respect: We cherish and treat each person as an individual created in the image and likeness of God. We value the dignity, diversity and uniqueness of each person. Responsibility: Individuals are responsible for their own actions and for the common good. Excellence: We strive for excellence in teaching and in every other aspect of the Loras experience. Service: We encourage each member of the Loras community to serve others in an extraordinary way. experiences. Loras students demonstrate their ability to learn in active ways. and compassion. Loras students demonstrate their ability to decide matters ethically. to cultural differences. Loras students demonstrate that they contribute in responsible ways.